Although more and more students in India are pursuing niche careers areas out of passion and interest, they are still looked upon as fads that sound fancy but don’t pay much. 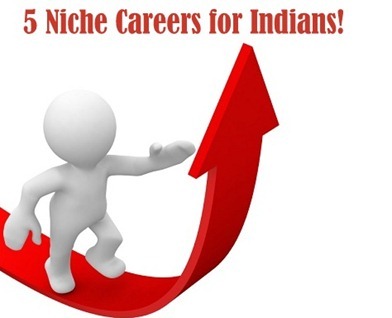 In fact, the reality about niche jobs in India is actually very different. The economy for unique, specialized services and products now has takers who are ready to pay a price. Let’s check out a few niche careers that have mushroomed in India from a few years. If you have a flair for writing, a passion for food, a penchant for traveling and a heavily nuanced insight into beverages and drinks, then you’re already a food critic! With Food and drink guides being released in India by the dozen, people like reading more and more about food and restaurant reviews and opinions. Just like we’re in the habit of checking reviews before watching a Bollywood blockbuster movie each weekend, it’s almost becoming a trend to say "Let’s see what Rashmi Uday Singh has to say about this restaurant" or "Let’s check Bhaichand Patel’s review on this bottle of wine". Although jewelry designing seems like it’s been around from ages, it’s actually studied and pursued academically by very few. If you’ve developed keen interest in gems, natural stones, silver, gold and an eye for craftsmanship or ‘karigiri’ as we call it in India, then it would be a great idea to further your interest in the same and actually study gemology or jewelry designing formally. You will love venturing into the hinterland of India to study antique, royal and timeless traditions of jewelry. Jewelry designing is not limited to simply designing ornaments. Many international luxury brands hire jewelry designers to work on their watches and bags, as they treat their products in the luxury segment like pieces of jewelry. Here’s a million dollar question. What does a corporate trainer really do? Does he/she really teach the CEO tricks of the trade or does he/she simply make money by giving fancy PowerPoint presentations? Many say that becoming a corporate trainer makes sense only if the trainer has significant amounts of experience in his/her resume to gain credibility. Every company who wants to put up a good face today, calls in corporate trainers to come in and teach employees a few non-traditional crash courses on communication skills, public speaking, motivation techniques, presentation skills, business etiquette, networking skills and other technical functions. Most students learn French in school or college and then forget it by the time they graduate. Most foreign language learning trysts end up becoming a thing of the past because not many people really consider the hidden unlocked power of knowing a foreign language. From providing translation services, to serving in an administrative role at a foreign embassy; from becoming a tour advisor to a foreign language teacher, the options are endless. If you have a flair for languages and cultures of the world, invest a few in learning a language to make it a niche career area that you can opt for in the future. Times have changed and students often aim to seek professional career guidance though aptitude tests rather than taking familial advice which is often heavily loaded with bias and emotion. More often than not, academic advisors and career counselors hail from a psychology background or may have spent several years in the academia. In fact, with the gradual mushrooming of career counselors, the tables have turned. Universities and schools now approach academic advisors to promote them in return of handsome favors! Your journey into a niche career may start off a little rocky, considering that there are no set routes, jobs or channels. You may have to carve your own way, sell yourself exhaustively and create demand for your products or services. But in the end, if you are guided by true passion, you will be successful. Any other Niche Careers you can think of?